I came across a unique component that caught my attention at the recent Los Angeles CanJam show. In a little booth, a French-Canadian company by the name of Bluewave was showing a matchbook-sized device that acts a wireless DAC, a USB DAC, headphone amplifier, and microphone. Bluewave calls the device the "Get," which I found fitting, as I was thinking that at $129, I needed to get myself one. A few months later, I got my hands on one to try out. The tiny Get measures 2.25 by 1.25 by 0.5 inches and weighs right at one ounce, making it nearly disappear in a pocket or easy to clip to your headphones. The body of the Get is primarily polymer, with one end being made from a metallic cylinder. There is a small clip coming off the top of the cylinder so it will fit flush at the top of a pocket, and a knurled volume dial at the top corner away from the clip. The metal cylinder houses a 3.5 mm headphone jack at the bottom, as well as a round control button for power, play/pause, and telephone answer/hang up. You'll also find a pair of triangular up/down buttons just below the control button. The combination of button location and shapes makes it very easy operate the Get via touch alone. Lastly, there is a MEMS microphone and a small led on the top, next to the volume knob, and a micro-USB port on the bottom surface. The Get features Bluetooth 5.0 wireless, with supported codecs including SBC, MP3, AAC, AptX, and 24-bit AptX-HD. Bluewave claims the 200-mAh battery will last for six hours of playback, and I was able to get close to that, with over five-and-a-half hours of use before needing to recharge the battery. Bluewave sells optional clips that allow the Get to be easily secured to your headphones. The Get's amplification is rated at 125mW into 32 Ohms, which should be plenty of power to drive just about any headphone you would attach the Get to when you are out and about. Other accessories include short cables and an impedance adapter cable for high efficiency IEMs. I used the Get with a few different headphones, including Ultimate Ears' Reference Remastered, Etymotic's ER4XR, and Mr. Speakers' Aeon Flow (closed back) headphones. As the Get is most likely to be used on-the-go with a portable device, I used my iPhone 7 as the source. All listening was through the Tidal app. I listened to several tracks from Imagine Dragons' album Evolve (Interscope, Tidal). The bass on "Thunder" was much more solid and powerful through the Get as compered to being directly wired to the iPhone. The soundstage was better defined, with more distinct imaging, as well. This was consistent with each of the headphones I tried. I continued my listening with a variety of current hits as well as audiophile standards. The results were consistent, with the Get outperforming the iPhone when it came to dynamics, detail, and imaging. The Get provides the ability to use your favorite headphones wirelessly, as well as for telephone calls. The sound quality is significantly better than what I was able to obtain with the same headphones connected directly to an Apple iPhone. 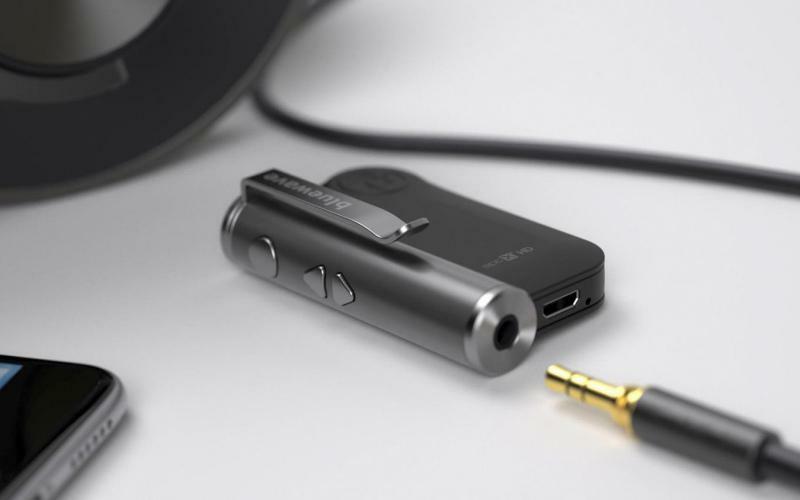 The Get has an USB DAC built-in, so it can also work with your computer. My biggest criticism of the Get applies only to when you are using it for phone calls (or other voice control): the microphone placement can make it difficult to pick up a voice. When using the Get and you need a microphone, you need to be conscious of where the unit is positioned. The Get's range was usually a few feet less than I could get with my Sennheiser or RBH Sound Bluetooth headphones. The ranges would vary by location, but when I placed my phone in one spot, I could usually go five to ten feet farther with the other units before losing the connection. Cambridge Audio's DacMagic XS has slightly less power at 105mW, but up to 192kHz/24-bit decoding via USB, whereas the Get's USB input only accepts up to 48kHz/16-bit. Audioquest's DragonFly Black and DragonFly Red at $99 and $199, respectively, are probably the best known of the tiny USB DACs. These units output 1.2 and 2.1 volts, respectively, so you can choose the model that best suits the power needs of your headphones. However, none of these units is wireless, and none of these units adds telephone/voice control functionality to your existing wired headphones. The Bluewave Get is one of those relatively rare products that provide improved convenience and functionality without impacting sound quality. In fact, throughout my many listening sessions with the Get, there was not one time where I preferred the direct to iPhone wired connection over the Get. The amp was consistently more dynamic and had less compression than the Apple iPhones or iPads I used in comparison. The only time I preferred not using the Get is when I was on telephone calls, as the microphone on The Get could not clearly pick up my voice from pocket. While I did not have the optional headphone clip, when I held the Get to the side of my headphones, or clipped it close to my collar, the microphone worked fine. At $129, the Bluewave Get is a very easy recommendation if you ever find yourself in the position of wanting to use any of your wired headphones in wireless setup or for phone calls. While there are a lot of good wireless headphones to choose from at this price range, the Get allows you to use your preferred headphones with mobile devices or computers without anything bulky weighing you down. • Visit the Bluewave Audio websitefor more product information. • Check out our Headphone + Accessory category page to read similar reviews.